When we were hunting for a school for our little giant, one of our main considerations was its proximity to our residence. 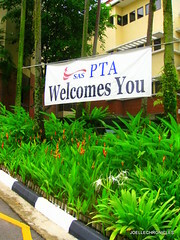 However, the more schools we visited, the more we realized that we shouldn’t focus so much the distance (Singapore after all isn’t a huge place) or its popularity. Our focus shifted to the school’s philosophy towards learning and how it is applied in the classroom as well as the cultural diversity of the student population. We ended up placing Andre in a school in Woodlands which is 30 minutes away by car. The future is not some place we are going to but one we are creating. The paths are not to be found, but made, and the activity of making them, changes both the maker and the destination. INSPIRE and ENCOURAGE. What powerful words. I was reminded about a conversation I had with a friend of mine about the different schools of thought regarding teaching. She said that while young and impressionable, we should “SEDUCE” our children to love learning by making it enjoyable. Overloading them with homework may make them proficient but it also tends to breed an aversion for further study. Yes they CAN read, but DO they read in their spare time? After school activities such as Kumon are well and good but what about having fun? EMPOWER with CONFIDENCE and COURAGE. I’ve had conversations with people about a number of “problematic” topics ranging from parenting to politics in which the vast majority shrug and say – “Well, what can we do? That's the way it is and that’s the way it always will be. People have mourned Cory and Ted Kennedy as if their deaths marked the end of the era of servant leaders. Well, our children are only as good as what we teach them to be for where else will they learn to bravely face adversity but through us. CONTRIBUTE to the Community and ACHIEVE their dreams. The world is changing so fast. The top 10 in-demand jobs in 2010 did not exist in 2004. I don’t see this trend changing anytime soon. How do we prepare our kids for jobs that don’t yet exist but at the same ensure that they don’t turn out to be like Joe? In Singlish - So How? The future is not some place we are going to but one we are creating.